Assessment of mobility, nutrition, neurological dysfunction, and cognitive dysfunction allow us to determine a solution and come up with a plan of action. 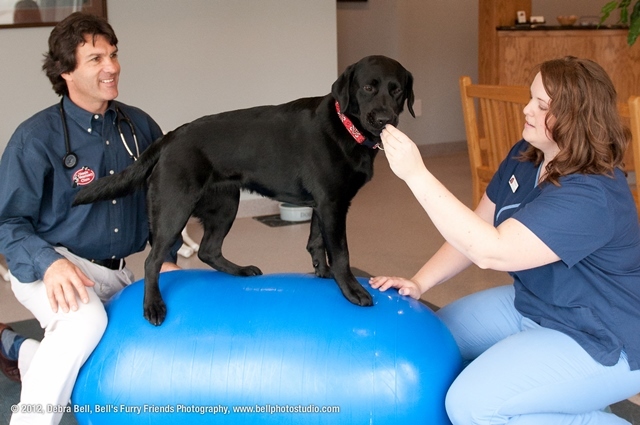 Post surgical rehabilitation with Heather, our Certified Canine Rehabilitation Practitioner. Assisting athletic canines with conditioning and core strengthening exercises. Dr. Cloutier opened the Veazie Animal Wellness & Rehabilitation Center with the goal of serving pet owners who want their pets to live a full lifespan that is both active and comfortable. More than just annual visits and vaccines, a wellness exam includes a comprehensive evaluation of health and a life plan tailored to keep pets healthy and active. Our goal is to help our patients live longer and happier lives, and provide an atmosphere of recovery and healing. Our trained therapists work one on one with your pet, applying a specific treatment plan and measuring progress at each visit. The therapist will teach you how to apply techniques at home to continue progress between visits and after therapy is completed. If you feel your companion is not at their best, or want to maximize performance, Dr. Cloutier invites you to visit our wellness center. Scheduling a consultation is the first step towards a more healthful, active life. We feel very fortunate to have discovered Veazie Veterinary Clinic and their rehabilitation services they provide. Our golden retriever, Phoebe, had ACL and meniscus repair surgery, performed by Dr. Cloutier, and is undergoing post-op rehab therapy including exercises and hydrotherapy. Between the expertise and the compassion and love for animals that shows through all that the clinic’s staff does for the client and the pet, the outcome can only be positive. We travel 1 and 1/2 hours each way to get to the clinic and every mile and minute on the road is worth the experience and professional instruction we receive there and take away with us. Thank you doesn’t quite cover our appreciation but it is where we can start.